We are sitting inside our zipped up tent wearing hats, head nets, gloves, zipped up coats and trousers tucked into socks. It’s very hot. Yep, it’s the midge summer season. Welcome to Scotland! Yesterday we drove up from the North Devon Coast to Glasgow then cycled down to Ardrossan on the Scottish west coast and across to Arran. 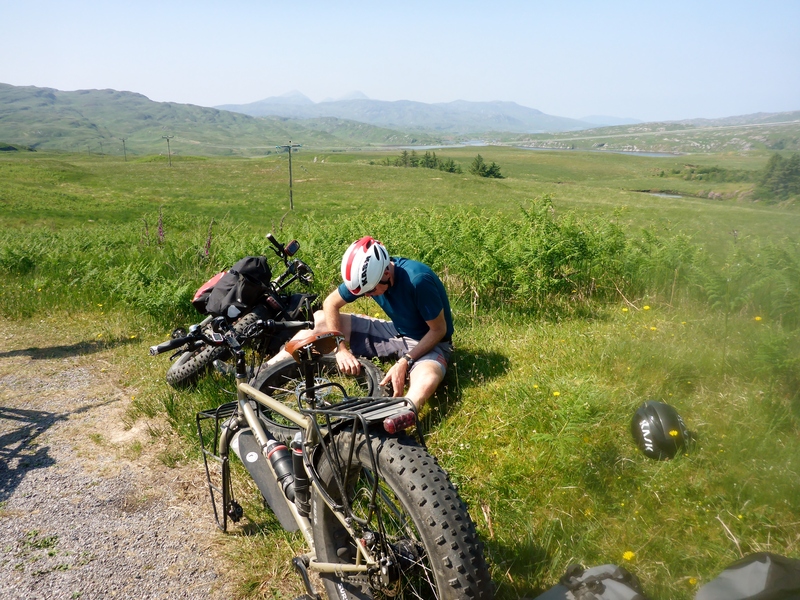 Normally we like to cycle from home and hop on a train if we have a far flung start, but as this was our first shake down tour since Bernie built the Fat Bikes it felt prudent to have a vehicle handy in case anything broke. 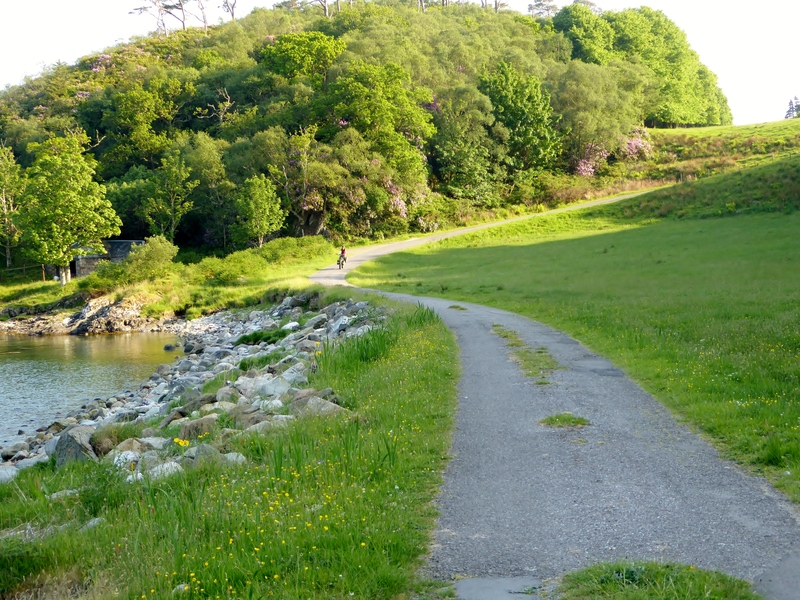 We are planning to go over the Kintyre peninsula from Lochranza to Kennacraig, ferry to the Inner Hebridean Islands of Islay, Jura, Colonsay then across to Oban and back to Glasgow. You can see our track on the Links, Tracking and Maps page. 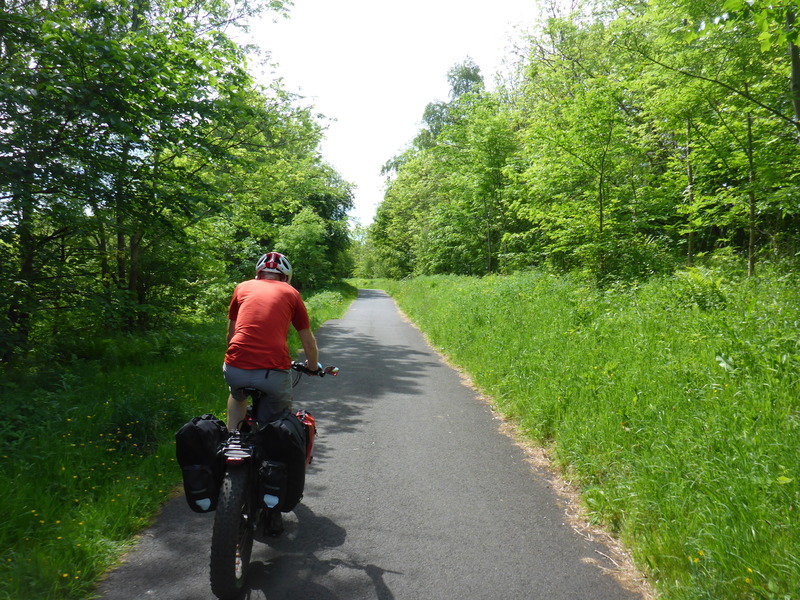 Cycling down to the coast from Glasgow along Sustrans Cycle Route 7 was a pleasant, gentle start using the old railway which was mainly traffic free. Already the Fat Bikes where getting a lot of interest from passing cyclists, including a CTC tour group from Glasgow, and pedestrians alike. 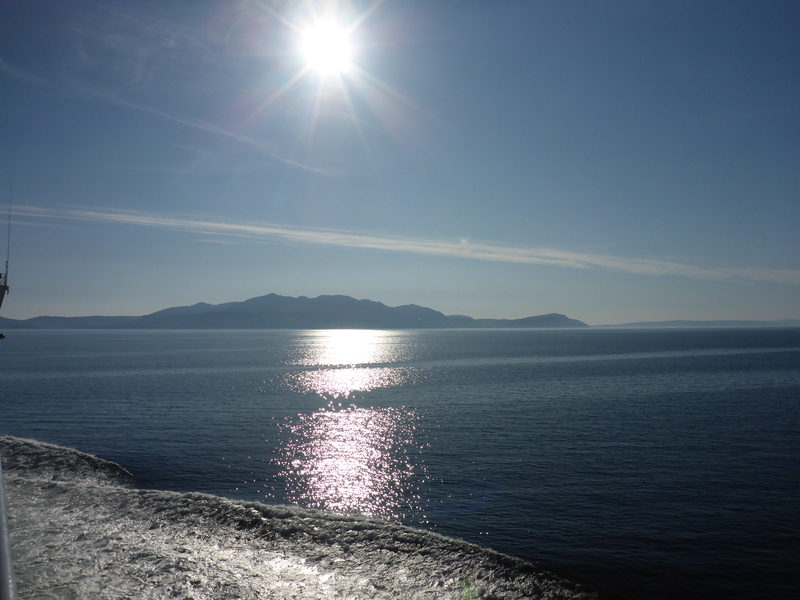 The weather on the West Coast of Scotland has been unusually hot and sunny for the past 3 weeks so the ferry to Arran was packed. As it was early evening when we arrived in Arran our first stop was a pub serving delicious local seafood and cheesecake to die for. That’s one of the good things about cycle touring, you can eat as much as you like. 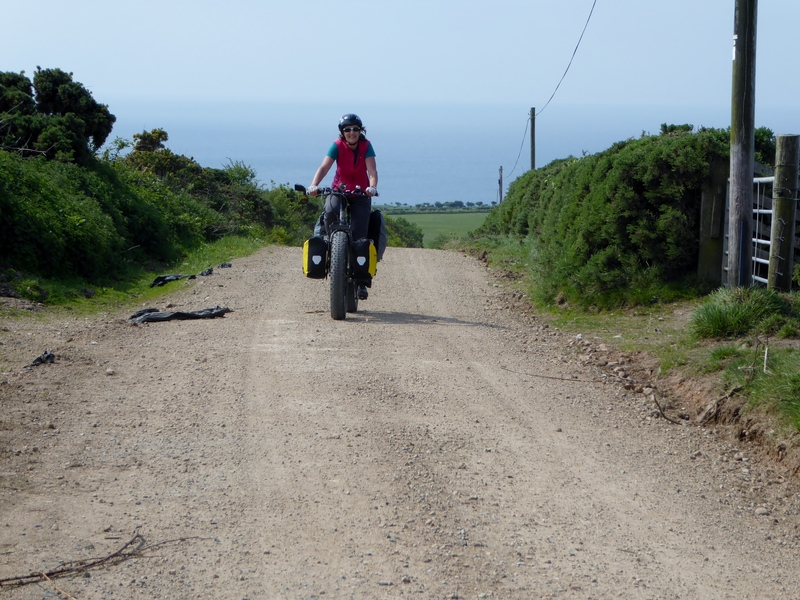 Then we set off for a campsite that had been recommended by some cyclists we had met on the ferry. 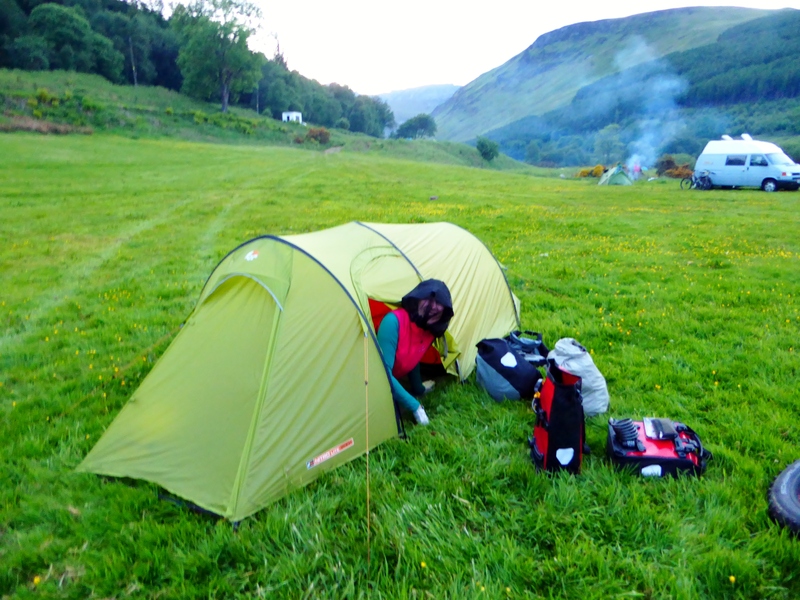 I am sure it was lovely, but unlike the other campers we had not thought to bring anything to start a smokey fire to deter the midges and had not yet learnt of “Avon Skin So Soft” which is the only thing that will deter them. As Arran was busy due to the wonderful weather we were glad to leave the roads and head up the forestry tracks and check out the Fat Bikes performance in their natural environment. They performed well over the 15 km of steep gravel tracks especially on the deep gravel and sand sections that I have always struggled with on my Thorn tourer. Once back on the road we were passed by packs of roadies many of whom we had met on the ferry over, and were to meet again as we went from island to island. 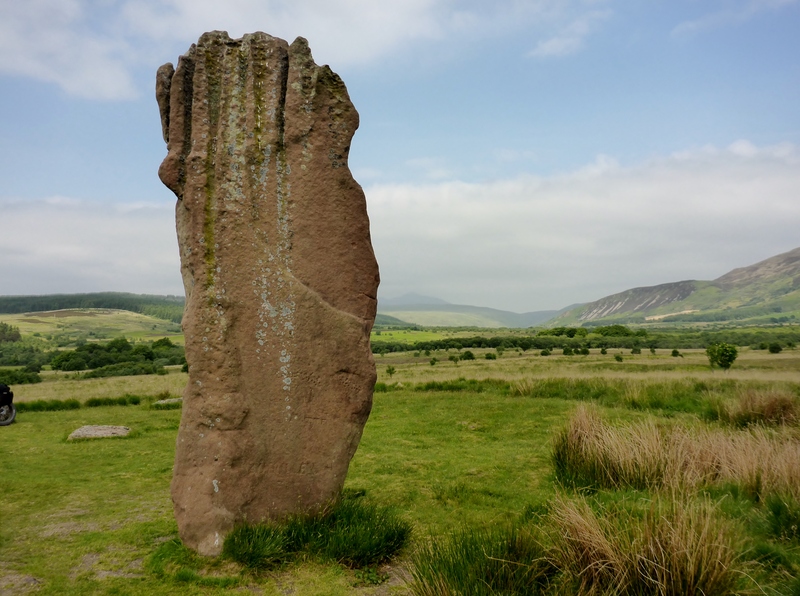 At Machrie Moor we were able to leave the tarmac again to cycle across to the Standing Stones. There are at least 6 stone circles in this valley dating from 1600 – 1800 BC, some of them on the same site as earlier wooden structures. There are also hut circles and other prehistoric remains in the valley. It is a very atmospheric place. 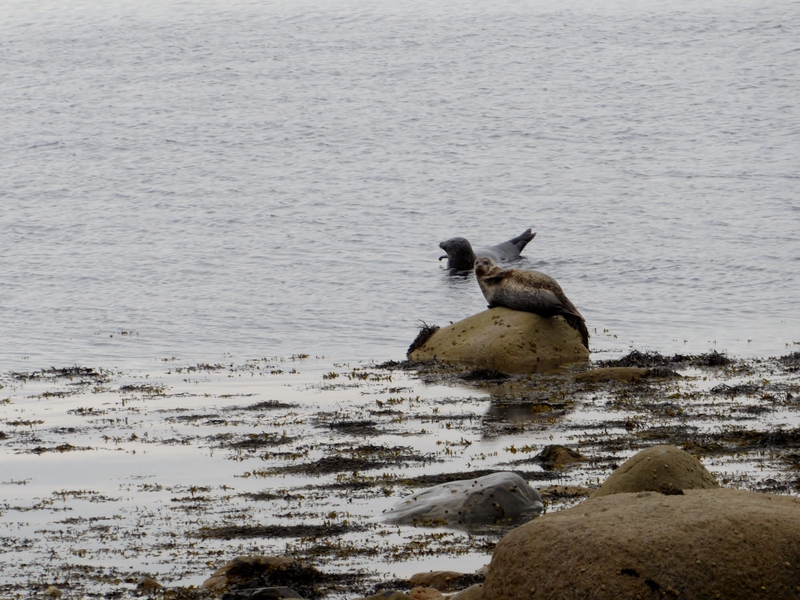 Returning to the coast road we saw a lot of wild life on Arron and watching the seals sunbathing on the rocks tops curved like static boomerangs made us laugh as the first one we saw, the tide had hidden the rock, looked like it was hovering over the water. 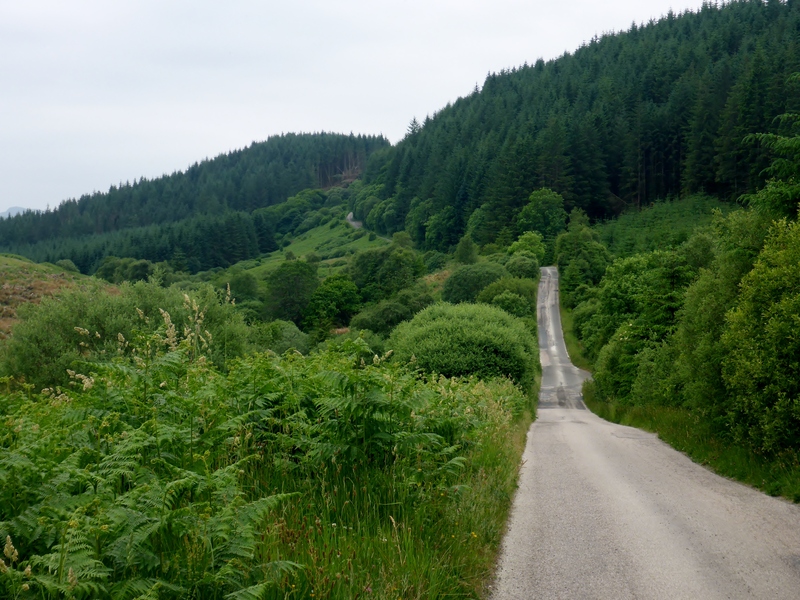 Although Arran was scenic it was much more developed and busy than I had been expecting so I was glad to hop on the ferry across to the rural country lanes of the Kintyre Peninsula. 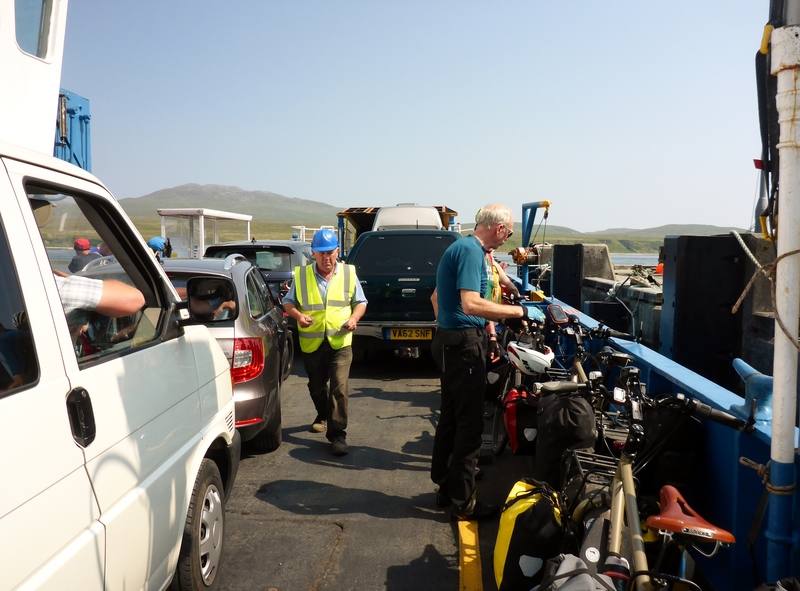 Arriving at the ferry at Kennacraig we found our lack of forward planning was a small problem as we could only get a ferry to Colonsay on a Wednesday or Saturday, which meant that we would have less time to spend on Islay and Jura than we had hoped. Once on Islay we got straight on the next, much smaller, ferry to Jura, which was as peaceful as we had hoped. Having had lunch in the small village of Craig House we set off towards the remoter far end of the island. 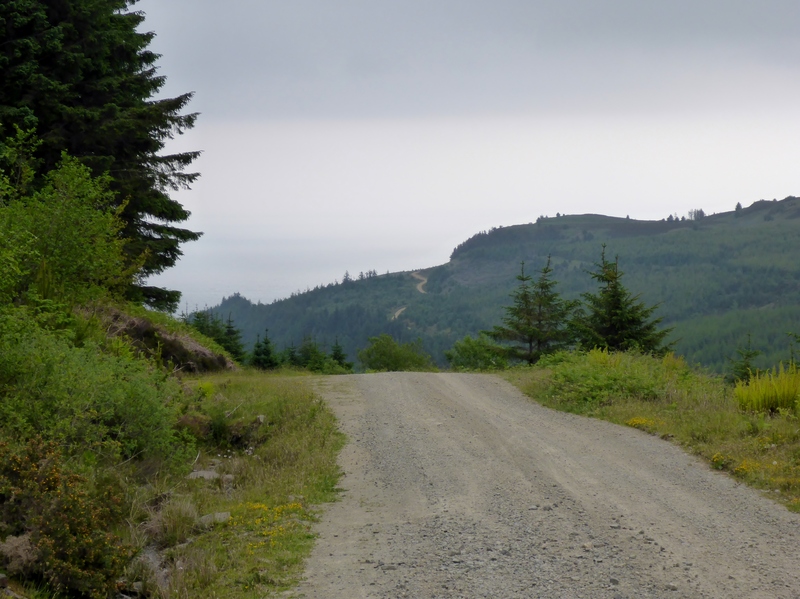 After 40 kms the tarmac runs out but just before this the road becomes a very steep roller coaster which was hard going but had beautiful views. We passed lots of deer and Angus cattle then made our way along the stone track looking for a cliff top view point to camp for the night. 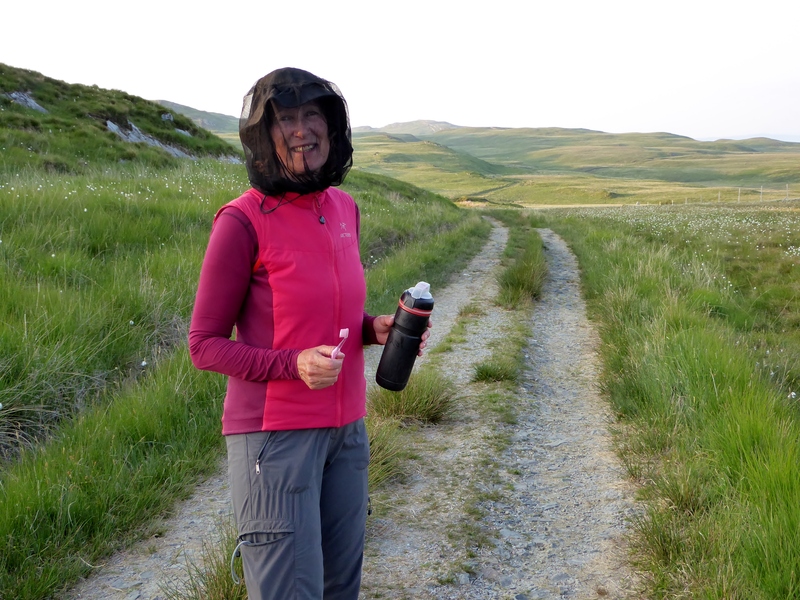 The wind had dropped by this time, so as soon as we stopped we were smothered by midges. Although it was nearly 8 p.m. it was still too hot to zip up inside the tent so we eat as we walked further along the track. Trying to clean your teeth with a head net is impossible! The morning was very different and made the cycle out to this remote spot on Jura worthwhile. There was a gentle breeze that that blown all the midges away. 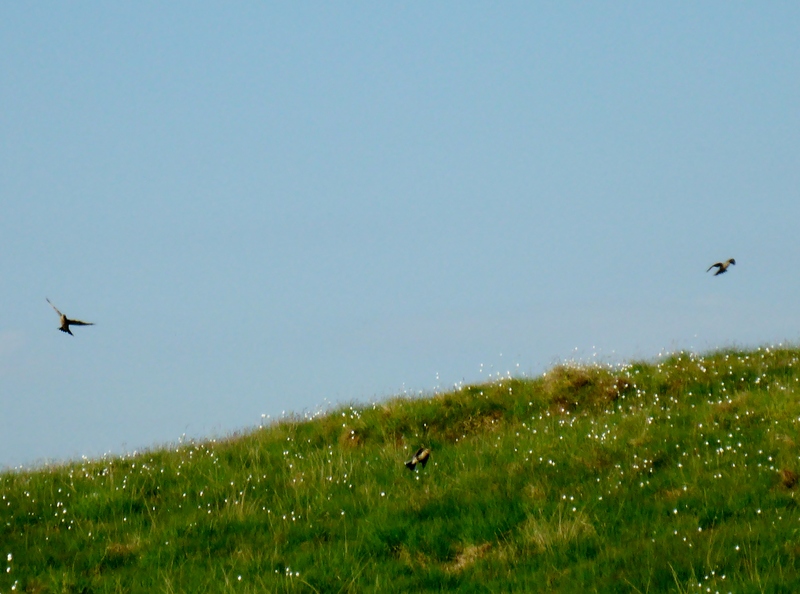 I emerged from the tent to find that we were surrounded by skylarks singing their hearts out as they spiralled up high then dropping back down. 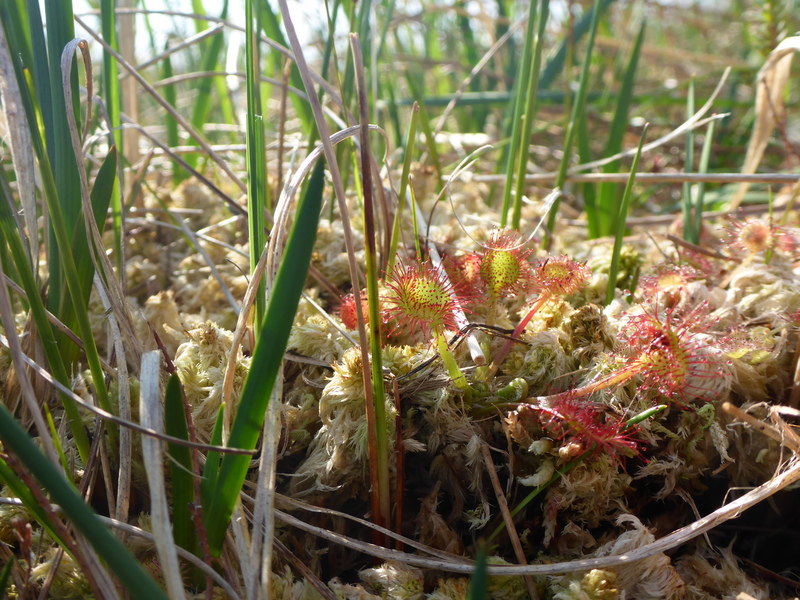 We also had a wonderful view out to sea while we eat our breakfast, surrounded by cotton grass and Sundews. 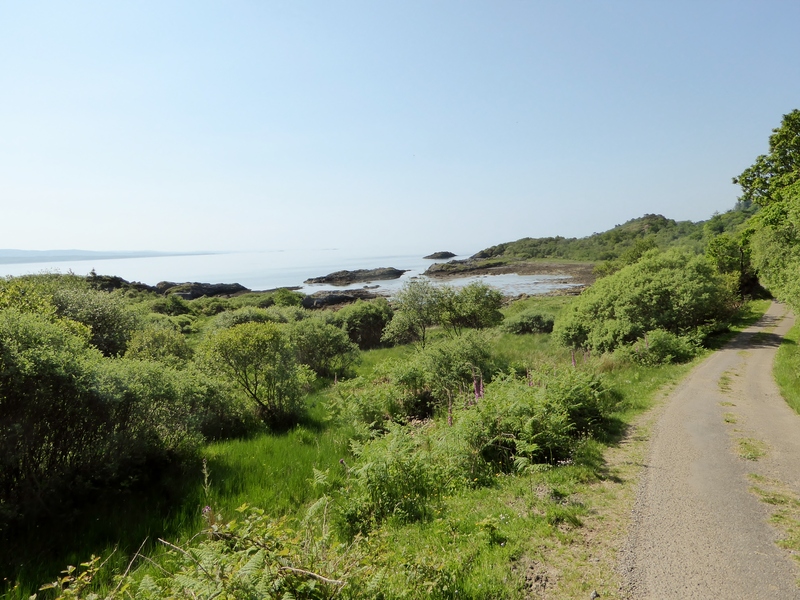 We didn’t have time to continue down the track to see George Orwell’s house retreat of Barnhill, where he completed his novel Nineteen Eighty-four if we were going to have time to visit Islay before the Wednesday ferry left for Colonsay. 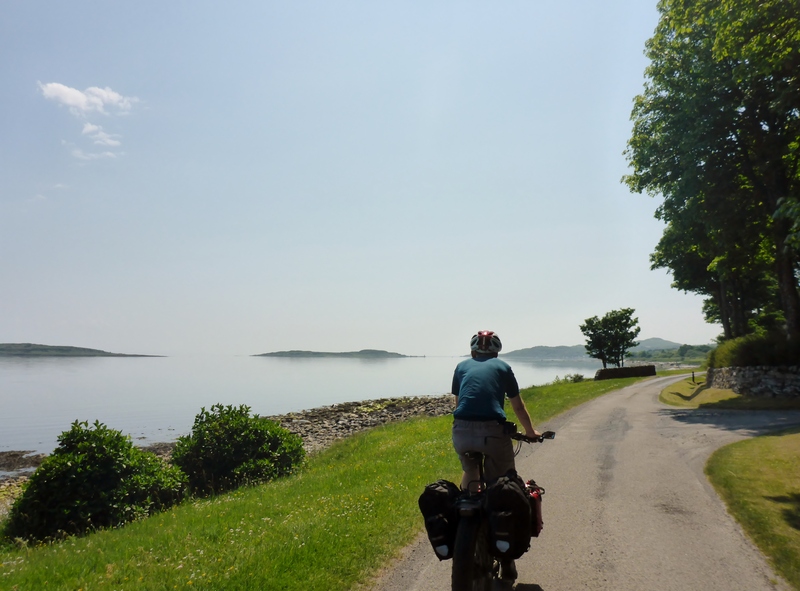 So we reluctantly left our peaceful campsite and cycled back along the beautiful Jura coastline to Craig House for lunch. Stopping on the way to mend a puncture. We had been wondering how vulnerable the fat tyres were going to be to getting punctures and it didn’t look too good getting one this early in the trip. The upside of the puncture stop was this it gave me a moment to look at the local flora which included a lot of purple orchids. 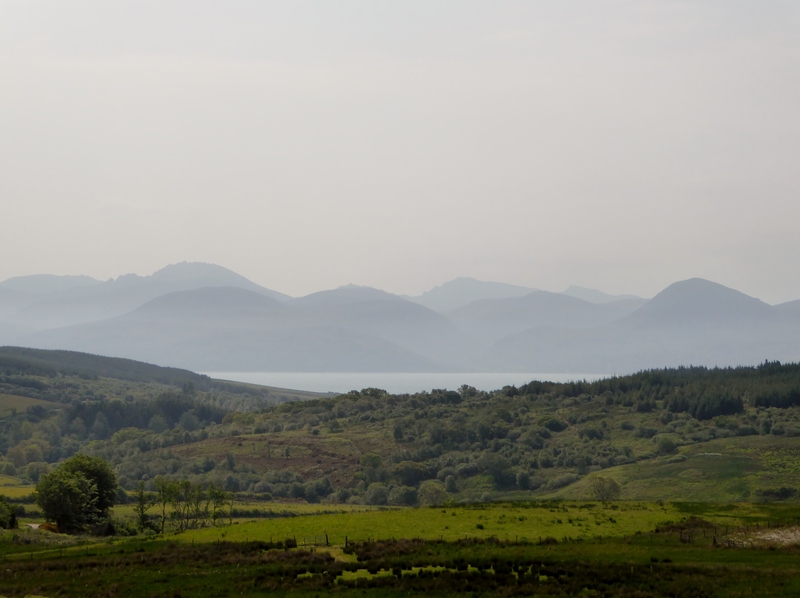 We both loved Jura and wished we had planned to stay longer. 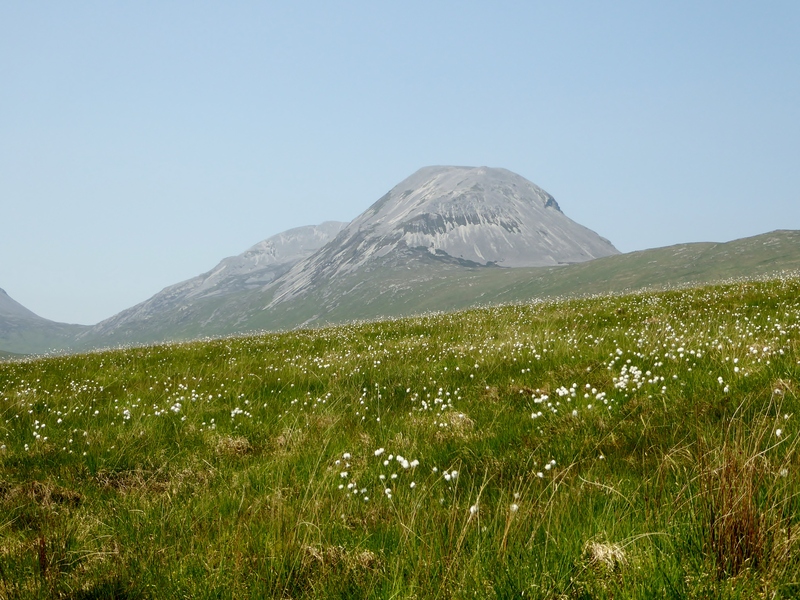 We met a lot of walkers and it would have been great to explore the rest of the island on foot but as it was we could only admire the rugged beauty of the Paps of Jura from a distance. We chatted to some of the distillery workers and fishermen in the small hamlet of Craighouse and it was nice to find that there is a thriving community of young families still living there, as on many of the remoter islands the young people have moved away. Once back on Islay we decided we could do with a night away from midges and had thoughts of a shower. But the good weather meant everywhere was fully booked, mainly, it seemed, with groups from Switzerland. A kind landlady rang around all her friends and eventually we found a bed for the night, but as always, it was at the top of a very steep hill. 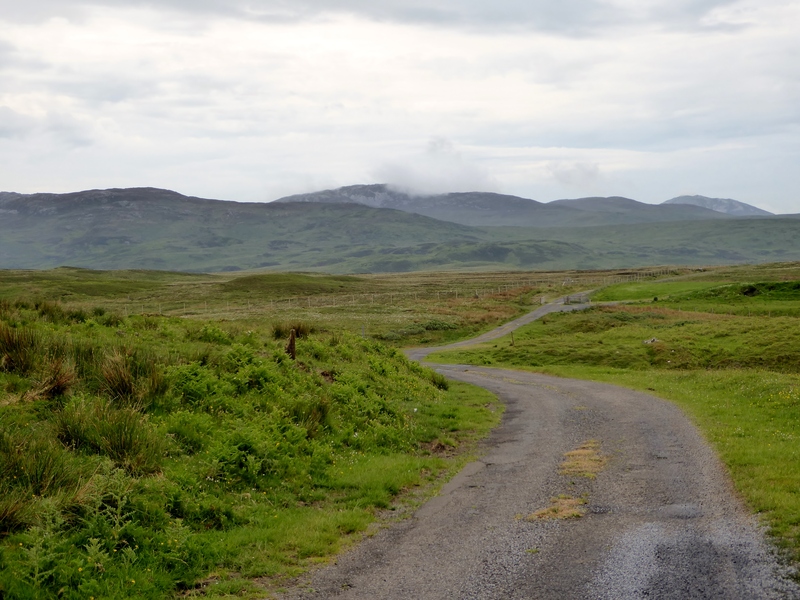 Our time on Islay was spent in more normal Scottish weather as the following morning the low cloud and drizzle moved in. 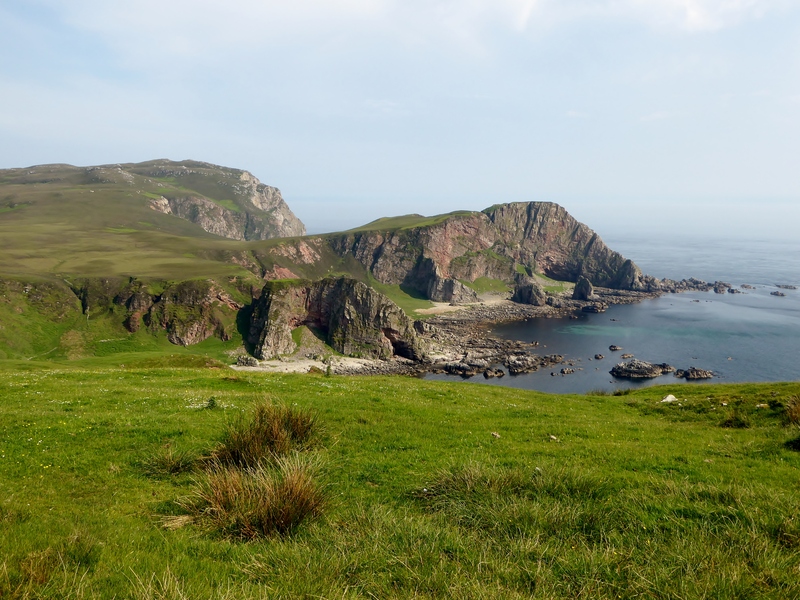 We decided to keep away from the main road so set off down the centre of the island towards the Mull of Oa and the possibily of sighting a Golden Eagle. We didn’t see any eagles but we did see some Choughs, which was great as they have recently died out along our North Devon coast at home. It was quite a spectacular area with steep craggy cliffs. Actually, it looked just like home even down to the red cliffs. 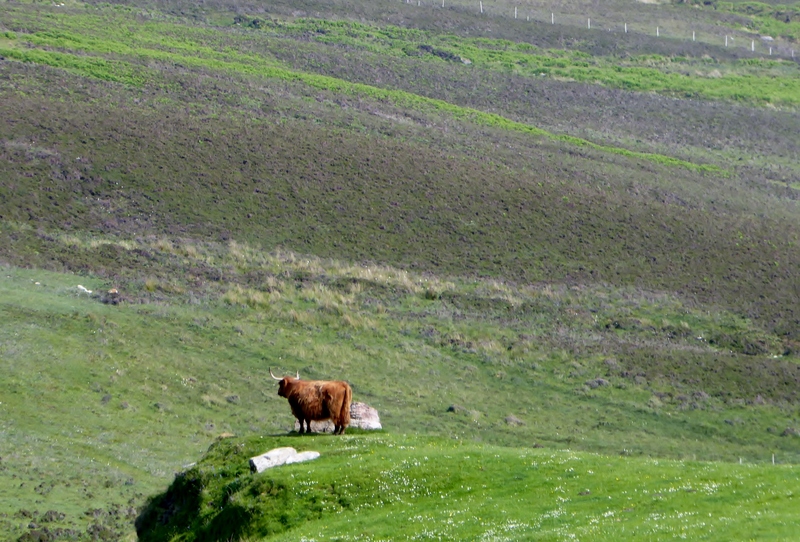 and the odd thoughtful cow admiring the view. Early the following morning we cycled through thick fog to catch the Wednesday ferry to Colonsay where we met the now regular group of cyclists on the quayside. 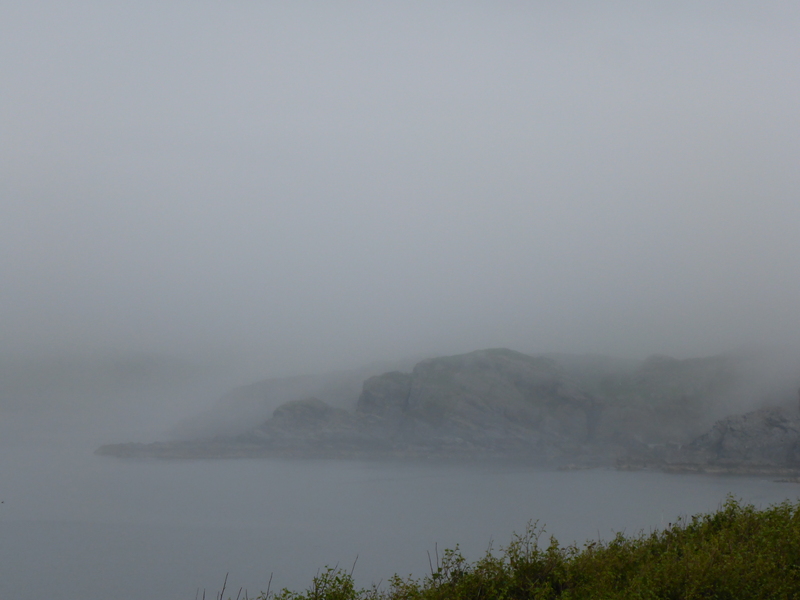 The fog lifted as we approached Colonsay. We were going to stay with a friend of a friend on the island and it turned out, when we asked directions, that we could only get to their house when the tide was out. So in the meantime we set off to explore what turned out to be a surprisingly steep and very varied small island, that had some of the most beautiful beaches if have seen. What also surprised me were its wooded valleys. I think I had imagined these islands much more bleak like the Outer Hebrides. On the way to Kiloran Bay we visited some gardens to get in some plant time, then past the Bay and up an almost unrideable hill. This showed up the next problem with the design of the Fat Bikes. I am reliably informed by Bernie that the amount of pressure he had put on the pedals to get up this incredibly steep hill had bent the torsion bar for the Rohloff speed hub. This was quite a serious problem this far from any metal bending device and meant that for the rest of the holiday we would have to go up hill gently! I really don’t know anything about mending bikes and Bernie has promised to do a blog about building a fat bike. 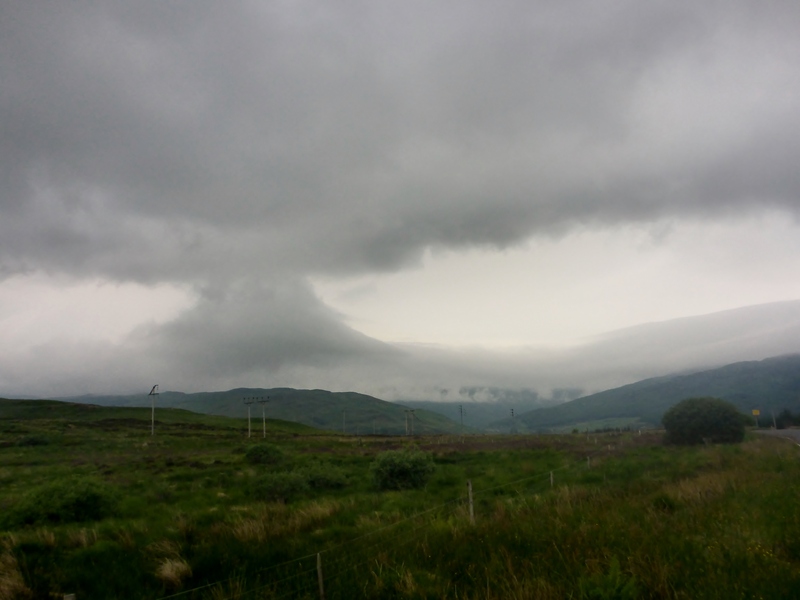 So while he was sorting this out I turned to the view that was just disappearing behind the incoming mist. We decided to head back across the island to find our bed for the night. 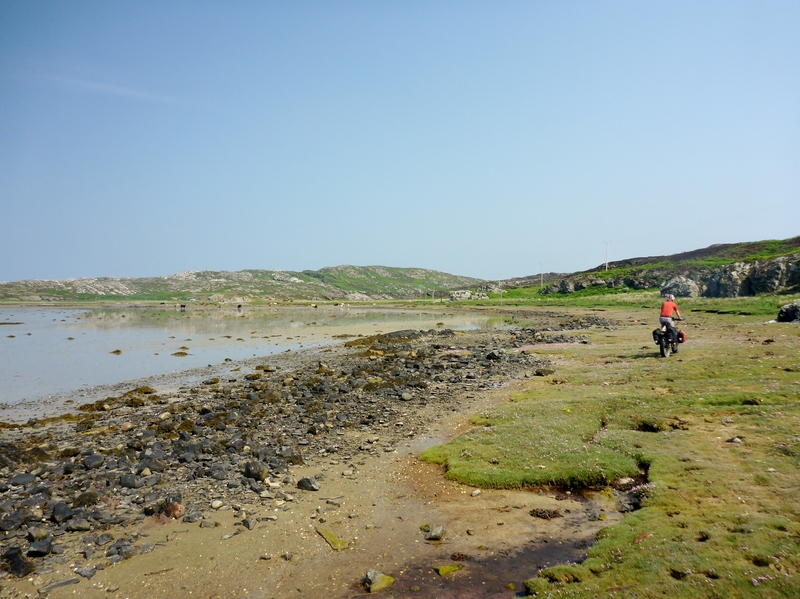 We arrived at the Strand which, when the tide was out, is a massive area of sand linking Colonsay to Oronsay. 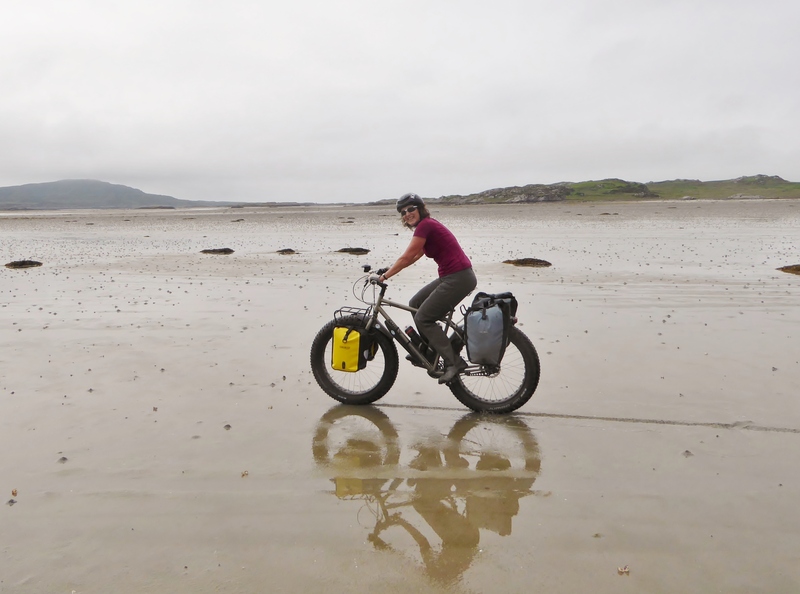 It was great just being able to cycle across the sand (trying not the think about what the salt and sand was doing to the bike). With the fat tyres it was like cycling on concrete. The people we were staying with had lived in this remote location for over 30 years and he looked after most of the black bees in hives all over the island. It was a truly special place. The following morning, as the tide was in we cycled out around the edge of the bay. and headed off to the far end of the island to visit the isolated Balnahard Bay. Bernie had managed to bend the torsion bar more or less straight so we hoped it would hold for a few more big hills. This was going to be the ultimate test of the fat bikes and the route was not only steep and rocky, but in places is was steep with deep dry, dune like sand. The bikes coped with this as if we were still on the tarmac, and even better, they felt so secure that I lost some of the fear I often have of steep rocky descents. 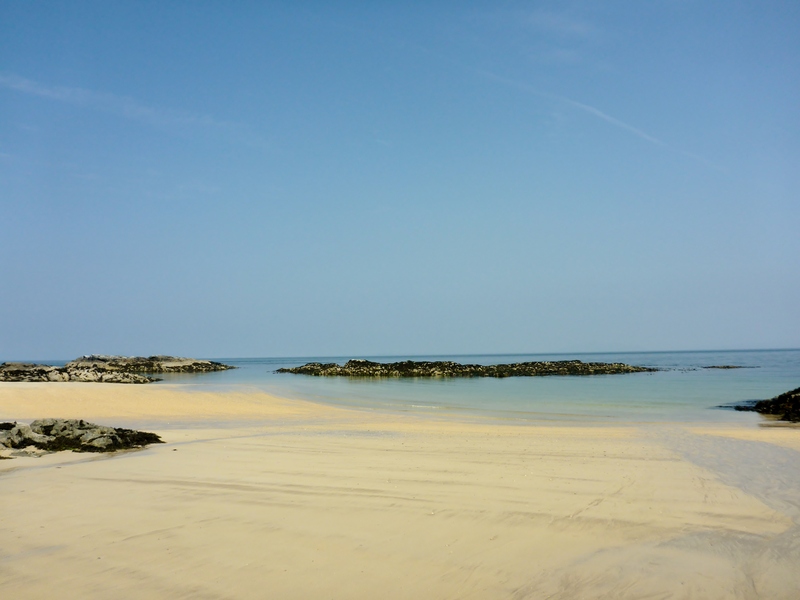 Then getting to the totally deserted Balnahard Bay was just wonderful. It was a great day, but we had to catch the evening ferry to Oban. 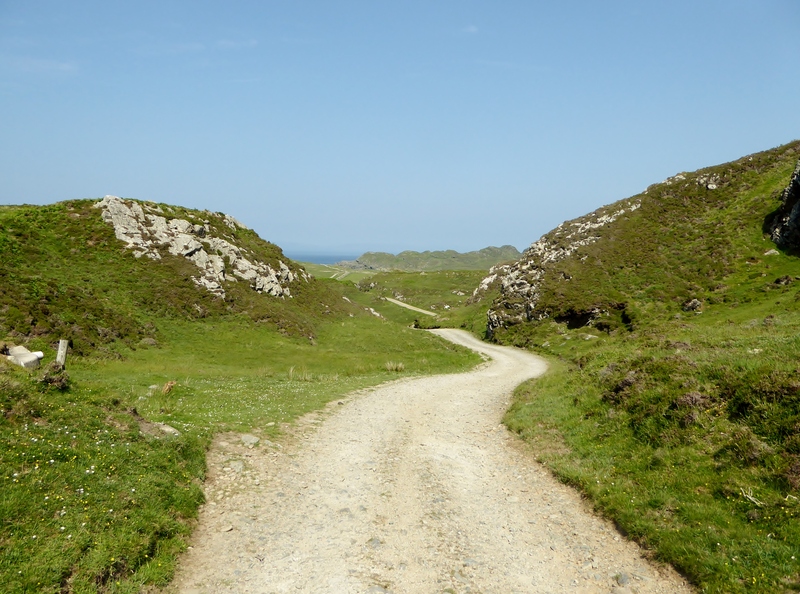 We both loved Colonsay. Arriving in Oban it just seem so busy and full of cars after our idyllic time on the islands. We booked into the Backpackers Hostel which was as comfortable as always. 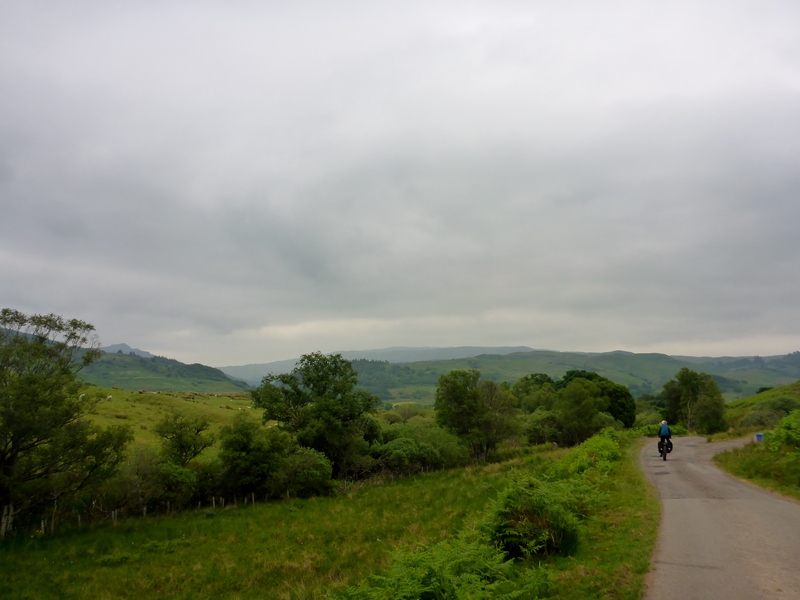 The following morning we set off along Sustrans Route 78 and 75 towards Glasgow. The mist had returned but the route was stunning. We stopped off at the friendly village of Taynault for coffee and cake in their little village run cafe. 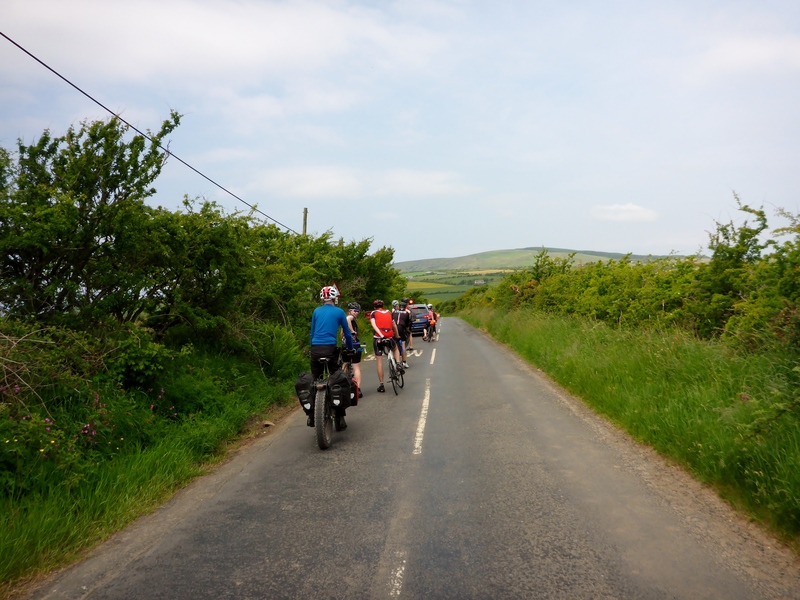 As usual with Sustrans it was a really hilly route and we were a bit worried about Bernies bike holding out. To be honest I was also a bit worried about my legs holding out as it was like a roller coaster. I had assumed cycling along the Lock Awe shoreline would be flat. At lunch we met a group of cyclists from Brisbane, Australia and we didn’t like to spoil their day by telling them what was coming. 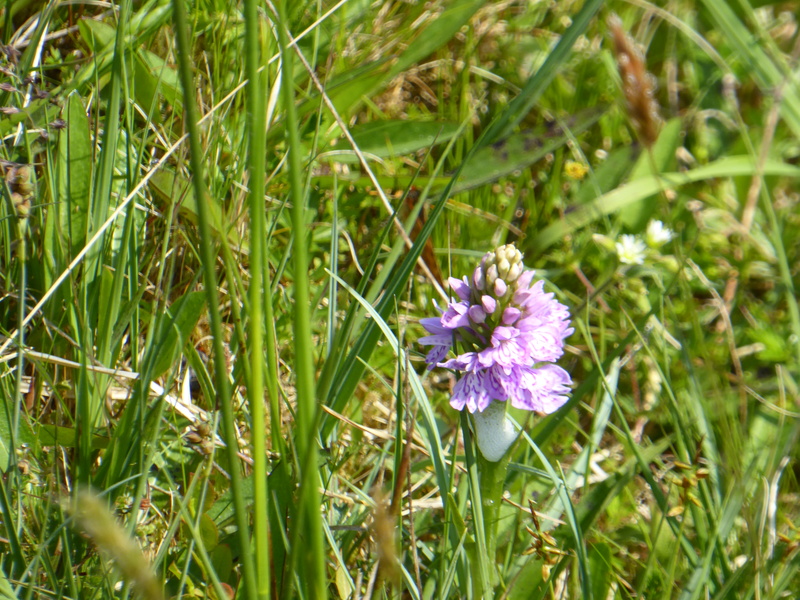 We cycled through some ancient woodlands full of thick green moss and large areas of white orchids. The weather was getting more dramatic as we headed for the ferry at Tarbert that would take us over to Portavardie then on to Dunoon. 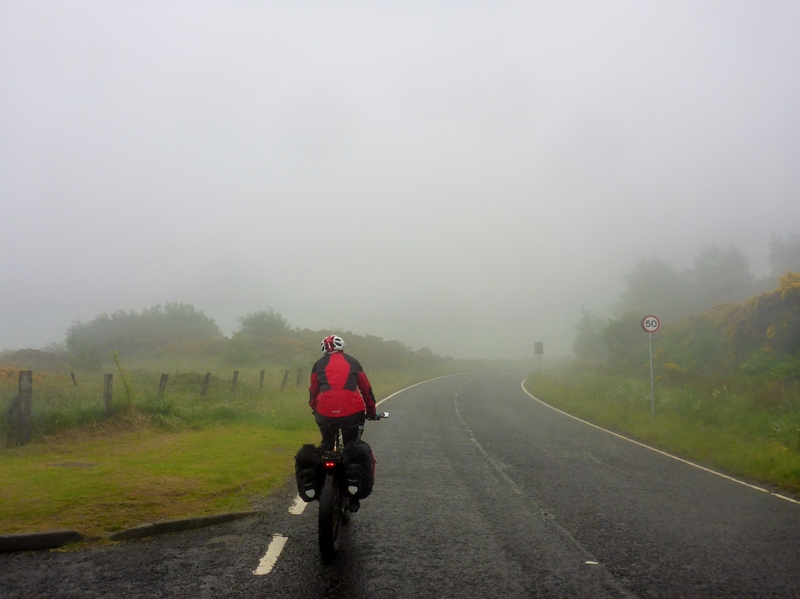 The next day we caught the early ferry from Dunoon over to the mainland then up a very long steep hill into the rolling fog to the Sustrans route back to Glasgow. 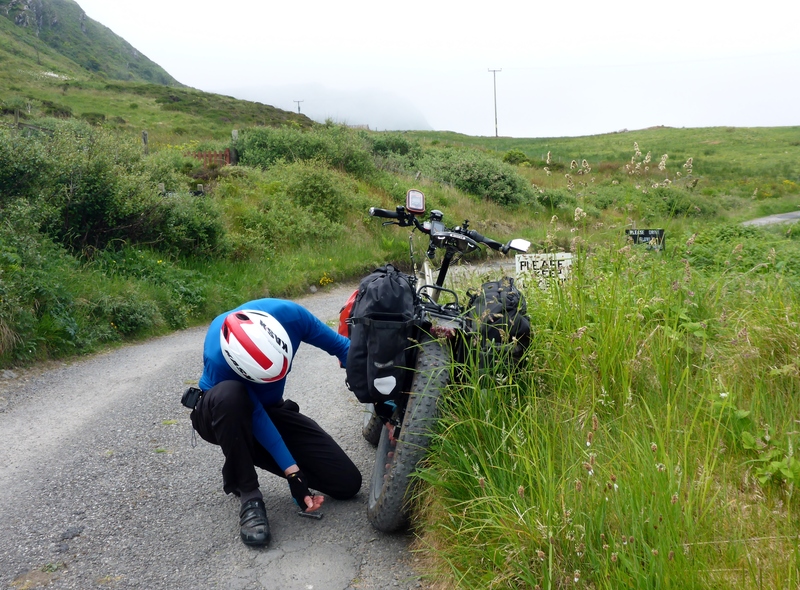 Previous Previous post: Cycle Touring – Can you afford to have an Accident even with Insurance?